Whitby Goth Weekend has been drawing huge crowds for two decades, but the arrival of new player Tomorrow's Ghosts is causing tension. Festivalgoers feel like they're being asked to choose a side. Like bats coming to roost in an old church at night, goths from across the UK gather twice a year at Whitby, a historic fishing town on the northeast coast of England, for a weekend of music, leather, lace, and pints of snakebite with friends made over years of devotion to the spookiest of subcultures. Whitby Goth Weekend began in 1994 when its founder, Jo Hampshire, a Barnsley-born goth with rainbow-coloured hair who still runs the event, put an advert in the music paper NME, asking if any of her fellow goths fancied meeting up in Whitby. Whitby has long been synonymous with the goth subculture, not least because of its association with the fictional goth icon Dracula, who famously swept through its spooky old streets in Bram Stoker’s novel of the same name. Hampshire expected just a handful of people, but around 200 turned up at The Elsinore pub, and in the following years Whitby Goth Weekend sprawled into a twice-annual festival of both official and unofficial events, that are a must on the goth social calendar. So popular is Whitby’s goth festival that people book their accommodation up to two years in advance. When the event is on, every guesthouse and B&B has a “no vacancies” sign in its window. When BuzzFeed News visited Whitby for this October’s goth festival, groups dressed in elaborate costumes of corsets, cloaks, and top hats — all black, of course — packed the windswept seaside town. Others wore band T-shirts bearing names such as goth-classic Inkubus Sukkubus, metal-clad New Rock boots, and long, dark wool coats, that they’d be as likely to wear at home as at a goth festival, representing a more purist school who are there for the music not the fancy dress spectacle. Both factions seem to co-exist in relative harmony, according to Sinister, who counts himself as a full-time goth, and comes to Whitby for the music. But now a new existential schism threatens to pull the long-standing festival apart. After two decades, the future of Whitby’s Goth Weekend has become uncertain as tensions between the old school and the new threaten to split the community in two. Talk of allegiance, loyalty, and betrayal haunted the town’s ancient pubs as diehards of the goth subculture found themselves torn between the official Whitby Goth Weekend – which includes the Bizarre Bazaar market in Whitby Leisure Centre and a gathering at the Abbey Wharf pub – and newcomer Tomorrow’s Ghosts Festival. Tomorrow’s Ghosts became the main music event after Hampshire’s team lost the license to put on bands at Whitby’s biggest venue, the Pavilion. SIV Live, which owns the Pavilion, said the decision was a result of insufficient safety plans for the event. In a statement on Facebook, Hampshire said: "Events of the last few days are the end result of an 18 month battle to provide a safe environment for our attendees. Our inability to secure ongoing contracted dates made it impossible to secure a premium line up and provide attendees with confirmed event dates." Many who have been coming to Whitby for decades remain loyal to Hampshire, who accuses Absinthe Promotions, the organisers of Tomorrow’s Ghosts, of opportunism and capitalising on the crowd that she and her team have built. Many goths we met in Whitby told BuzzFeed News they felt standards at Whitby Goth Weekend had slipped in recent years, and said the event had become elitist and resistant to change. “There are always gatekeepers who will say that’s not goth, or you can’t be goth if you’re this,” Claire Nally, whose academic work focuses on subculture, told BuzzFeed News. But, she added, the evolution of a subculture is essential to its survival. “Subcultures are kind of like live entities because they’re contemporary, and they are always moving,” Nally continued. For those who had grown bored of Whitby Goth Weekend, Tomorrow’s Ghosts, whose lineup featured hugely popular bands including Paradise Lost and Fields of the Nephilim, was a breath of fresh air. When Tomorrow’s Ghosts April lineup, featuring New Model Army, was announced during this weekend’s event, it was met with further excitement. “Attendance and enthusiasm have been dropping away except for old traditionalists and blind supporters,” Sinister explained. While some stalwarts of the scene stayed away from Tomorrow’s Ghosts, which was packed out on Friday and sold out on Saturday, most people are unaware that there are two camps staging events over the course of the weekend. And argue they did. Louise Street, who previously looked after bands and did front-of-house work when Whitby Goth Weekend was still hosting the music event at the Pavilion, said she had removed herself from social media in the weeks running up to this year’s event because online discussions about the festival, particularly on Facebook, had become so vicious. “It’s been really upsetting for me because I’ve lost a job,” Street said. “That was my friend’s baby for 24 years. She brought the goth community together and brought the masses to Whitby. Street still organises a goth football match at the ground of local team Whitby FC, where Real Gothic don a black kit and run around the pitch with their long hair blowing behind them. “If you speak to about 70% of the punters at the football they’ll say ‘I hate football, but I love the goth football,’” said Street, who travels up from her home in Nottingham to run the event. The match raises money for several charities, including, inevitably, one focusing on bat conservation. The woman behind Absinthe Promotions is Kirstin Lavender, a former mortician who runs the events company with her husband. She dismissed what she described as the “angry, aggressive circle of people” behind Whitby Goth Weekend as a vocal minority. Through Absinthe Promotions, Lavender has been running literary events in Whitby alongside Bram Stoker’s great-grandnephew Dacre Stoker for many years, and decided to launch Tomorrow’s Ghosts when she was offered the chance to run a music event after Hampshire’s departure. “I said if we can do the literature and theatre events, music’s going to be pretty much a similar sort of thing, and it was a natural progression, especially with the scene in Whitby,” she told us. Like Sinister, Lavender felt Whitby’s goth festival needed to evolve and that bringing in a wider selection of bands was key to its survival. “These younger bands are the future of that subculture,” she said. “If we all cling to one type of band, then we’re just going to get old and die and then goth will be lost forever. As well as Tomorrow’s Ghosts, Absinthe also puts on the Dark Days market at the Whitby Pavilion, selling everything from taxidermy jewellery to skull-shaped candles. Traders there spoke highly of Lavender and her team. Carol Price, a vintage clothing seller, told us that she had avoided having a stall at Whitby Goth Weekend in recent years. She said she decided to return when she heard that the Dark Days market would be run by Lavender’s team. 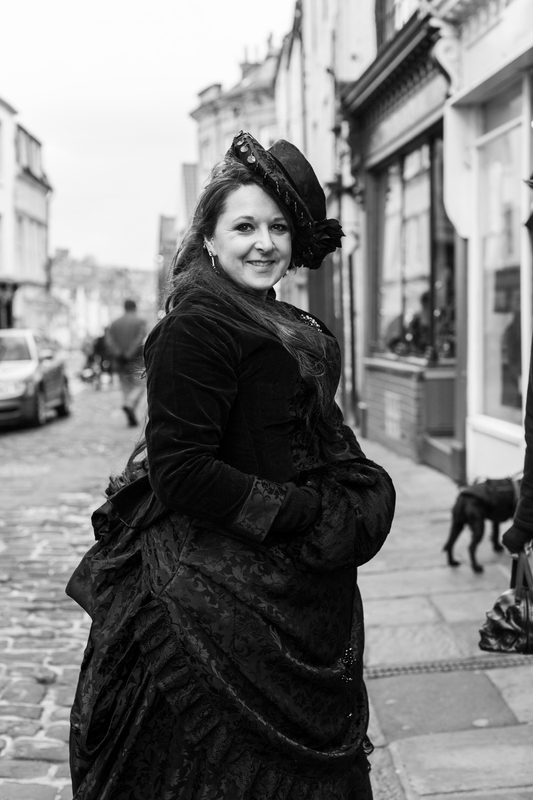 Tomorrow’s Ghosts and Dark Days will return for the goth festival’s usual spring dates at the end of April, but in response, Hampshire and her team have decided to run Whitby Goth Weekend as a separate event at the beginning of the month. Fans and traders are worried that it will split the crowd and, more so, the community. While others are staying loyal to Whitby Goth Weekend, they are concerned about its future if Tomorrow’s Ghosts continues to pull in crowds on alternative dates. This weekend, fears swirled among traders that those who had worked with rival organisers could be blacklisted. Sonia, who said she believed that newcomers were capitalising on the success of the original festival, felt like she needed to go where the most footfall would be in future. “We want to be loyal, but the problem is you can’t make a business decision out of that,” she said. As well as traders who come from all over the country to take part in the event, the goth festival is great for Whitby’s local economy. 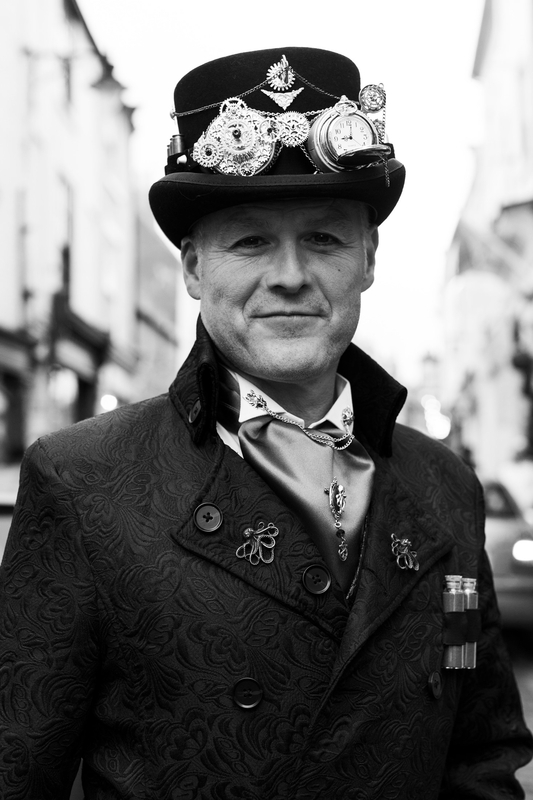 Plenty of people simply come for the spectacle of seeing so many goths parade around the town in full Victorian costume, so even if they don’t attend a ticketed event like Tomorrow’s Ghosts, they pack out the pubs and restaurants. Fans of the event, who considered Whitby’s goth festival as an important meeting place, were especially worried that the division could damage the sense of community found in Whitby. “It’s kind of like a sanctuary for most people,” 25-year-old Rachel told us ahead of Fields of the Nephilim set on Saturday. “Especially for myself — I come from a small, provincial Scottish town where being the person you want to be isn’t necessarily accepted by others,” she continued. A recent government consultation on hate crime has considered adding goths to its list of groups who experience discrimination. Rachel also hoped the promoters could settle their differences and find a way to host an event that could bring people together rather than divide them. “Whitby is for everyone,” she continued. “It’s all about coming together in a place with like-minded people who you feel safe with.